I often joke that the color wheel is missing a shade, one I would affectionately call “Copenhagen gray.” A delightful combination of dull steel blue and gunmetal. Although this winter has been particularly bright, there are still those days that seem like the sun never actually rises…and then it’s nighttime. I suppose that is why this week, I’m craving color—something bursting with crystal clear hues and juicy flavors. We’re rounding the corner to spring and I can feel it everywhere: little yellow buds poking up through dark, wet soil, the light ever so slightly higher in the sky, and the biting wind changing to something kinder. This hint of changing seasons inspired me to create a warming, fragrant, spice-laden, technicolor masterpiece. Inspired by the traditional Persian jeweled rice, this recipe is simpler; you cook everything in one pot and, of course, use brown rice in place of the nutritionally deficient white kind. 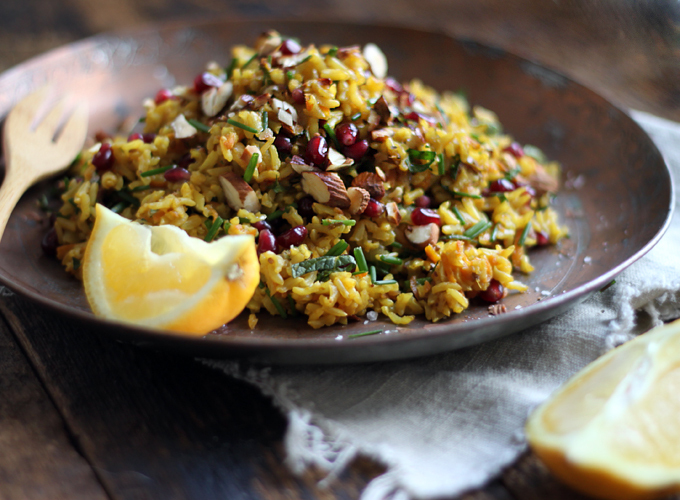 I love the combination of orange, cinnamon, saffron, and cumin, all together in a mound of basmati perfumed with mint, roasted nuts, and pomegranate seeds. Juicy indeed. You can tell that times are changing when your local sushi joint suddenly offers a brown rice roll in place of the white version. It seems that people everywhere are making smarter choices when it comes to grains, and seeing higher-fiber options pop up on grocery stores store shelves and on restaurant menus means that our “alternative, healthy ways” are reaching the mainstream. Rejoice! But what exactly is the difference between a whole grain and a processed one? In the case of rice specifically, is there anything more than just the obvious fiber loss? First we need to understand how a grain of rice is built. Each grain of rice is grown with an inedible, protective outer husk. Once it is ready for harvest, the husk is removed to reveal the whole grain, or brown rice, as we know it. This whole grain contains three vital parts: the outer layer called the bran, where fiber, B vitamins, and trace minerals reside. The second part is the germ, which contains essential fats, vitamin E, antioxidants, more B vitamins, iron, and zinc. The third part is the endosperm, which makes up the majority of the grain, and is comprised mainly of carbohydrates and some protein. As brown rice and white rice contain virtually the same amount of calories per cup (232 vs. 223), why not take the extra hit of fiber, as well as a whole host of essential vitamins and minerals? Jeweled rice dishes traditionally call for white rice, but I could not resist the fuller flavour and higher nutrient content found in the unprocessed alternative. This rice makes an excellent side dish, but it’s also hearty enough to be a meal. If you’re looking to boost the protein, simply add some lentils to the rice or toss some chickpeas into the mix before serving. This is also delicious with sautéed eggplant or mushrooms and a poached egg. Any way you dish it up, you’ll appreciate the mix of bright flavours and colors on a cloudy day. 1. In a small glass of hot water (3-4 Tbsp. ), add a pinch of saffron and let steep into a “tea” while you prepare the other ingredients. 2. Dice onion. Grate carrots. Slice off the outer edge of the orange rind, removing as little white pith as possible. Then slice into matchstick-sized strips. Set aside. 3. Heat a knob of ghee or coconut oil in a pot. Add cumin seeds and cook until fragrant, 1 minute, then add turmeric, bay leaves, and the cinnamon stick, stir to coat with oil and fry for another minute until fragrant. Next add onion, carrots, orange rind, and dried fruit. Cook until the onion softens, about 5 minutes. 4. Drain rice and add it to the pot with 4 cups of water, the saffron “tea,” and salt. Cover with a lid, bring to a boil, reduce to simmer for 45 minutes, or until the water has evaporated. 5. While the rice is cooking, wash and chop the herbs. Remove the seeds from the pomegranate. Gently roast the nuts in a dry skillet until fragrant and golden. 6. When the rice is finished cooking, remove form heat. Scoop rice out onto a baking sheet to cool slightly and to prevent the grains from sticking together. After a few minutes, sprinkle with herbs, nuts, and pomegranate seeds. Fold to incorporate. Season to taste (you will likely need to add more salt at this stage). 7. Serve rice with a drizzle of good olive oil and lemon wedge. Although the lemon may seem like an afterthought, it is an essential element of the dish, rounding out the flavours and adding a zesty kick. Enjoy! Great recipe!!!! It’s too delicious. I like it so much. Thanks for sharing it. Love this look of this, I’m going to try it tonight! I don’t know if you read comments to old posts, but I wanted to say that I’m in such a tricky situation with my IBS diagnosis, and then I found this recipe and was absolutely thrilled! It is so delicious! I have made it several times, and I really enjoy the blend of spices and the freshness of the pomegranate and mint that offset the sweetness of the dried fruits. I have taken the liberty of linking to your recipe from my blog (which is about living with a dicky tummy), I hope that’s OK.
Yummy. So good. Thank you! Just dropping in to say hi, from the Netherlands! 🙂 I’ve been making your awesome raw brownies almost every other week and I thought it was time to try out another recipe of yours..
Love your recipes…healthy and fascinating.Mixing some vegetable and fruits for a vegan lunch should be so idea for a summer day. The exotic flavours in this dish sound very appealing. I bet it tastes as good as it looks! You’ve reminded me to cook with mint more often – thank you! Saw you in March’s Bon Appetit! As a someone who is becoming a Registered Dietitian in the US, and who writes a healthy food blog as well, I love your recipes and especially love the holistic concept. Thanks for sharing and inspiring. thanks forthis yummyidea+the great shots! happy lazy weekend from crocusland! w-o-w the ultimate farewell breakfast i think! I’ve just discovered your beautiful blog. Thank you for such wonderful information and amazing culinary inspiration! Thanks Sarah for an amazing blog! I tried this dish yesterday (altough with quinoa instead of rice) it was amazing, so flavorful! Wow what a recipe. I made this last night for dinner, and had it again for breakfast – with an egg. Beautiful flavours and colours. Will cook this on a regular basis. Thanks Sarah! Looks beautiful, delicious, and oh-so-filling! I think I will follow your suggestion and add some chickpeas. Sounds like a satisfying meal, indeed! Thank you for another wonderful recipe. You are a constant source of inspiration! I love your blog..amazing photos and recipes..thank you for sharing! What a gorgeous dish! I always enjoy food more when it has visual appeal. I can practically smell it. So enticing..and rah! rah! meathless mondays!! Hi Sasha – I have a full glass (probably around 400 ml) of water with about 1/3 of a lemon juiced. I love the use of turmeric and the bright colors in this recipe, hopefully it will be an early spring in Copenhagen! I´m going through a total citrus frenzy at the moment so this dish is right up my alley. Thanks for yet another amazing recipe! Hey Sarah! How would you adjust cooking times and amount of added water for the rice if you were to soak it prior? I’ve had some trouble with mushy rice… thanks! This is the perfect dish as we transition from winter to early spring. The pomegranate seeds are the finishing touch! Yummy! I did I similar dish with quinoa and I called it Happy New Year Quinoa Salad. Love your blog! Sarah, you sure know how to make brown rice sing! I think that this dish includes the majority of my favourite ingredients and I can’t wait to make it. Thanks for another inspiring dish! Regarding a day in your diet, how much hot water with lemon is best to drink in the morning? I usually have just a tiny mug of hot water with a few splashes of lemon juice, but your (bright yellow) picture made me curious about what the best ratio would be to ensure that it is effective in working all of its magic. And I don’t drink with meals because it dilutes your stomach acid, hindering digestion. Happy to hear you are enjoying the blog! – sprouting nuts… How do you do this? – why never drink water with meals? What do you drink? Thanks for your time. I love your blog because it is so informative and everything’s so delish!